Once upon a time my husband did not like my potato kugel. This is not my opinion; it’s a fact. And I took no offense at his dislike…everyone’s allowed to be wrong about something. And especially, within the realm of potato kugel, tensions tend to run high. Kugel-eaters can be pretty adamant, and much like a Southerner takes personal pride in his grits or fried chicken, so too Ashkenazim take their potato kugel rather seriously. At the heart of the debate lay two issues: how you like it and how you make it. Allow me to explain. “That’s how you make it?” I overhear an older seasoned kugel maker say to another ballubusta. “Oh.” [Long pregnant pause.] “I make my potato kugel a bit differently”. There are a number of things it could have been that she did differently, but the most controversial one is probably: grate by hand or food processor? A friend once told me that in her family it wasn’t a real potato kugel unless someone lost some skin! Many contend that a hand-grated potato kugel is the only way to go and that it comes out differently than if you use the food processor. However, in today’s busy era, most women simply don’t have the time for hand grating. My personal compromise is using the fine (not course) grating blade of my food processor. Try both ways and you can be the judge! Always grate your potatoes together with your onions. This will keep the potatoes’ bright white color from darkening. Never delay baking your kugel once it has been prepared. 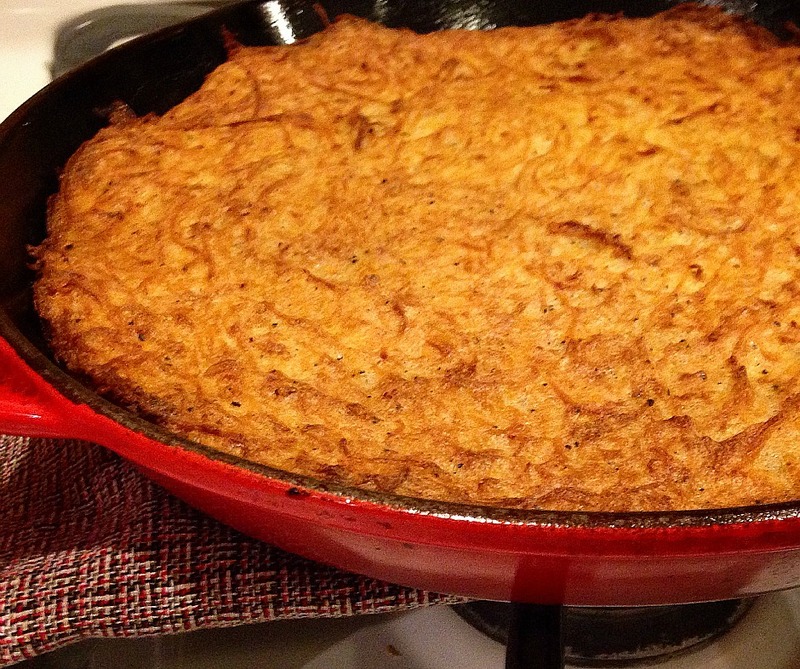 (One of the first times I ever made potato kugel, it was getting late on a Thursday night. I figured the smartest thing to do was to prepare the kugel, and bake it in the morning so that I wouldn’t have to wait up for it to finish cooking. The next morning came and I opened my refrigerator only to find a black potato kugel. Ahh…the power of oxidation). Heat your oil before adding it to the potato mixture. This will help produce a crispier kugel. Cast Iron pan all the way, baby! 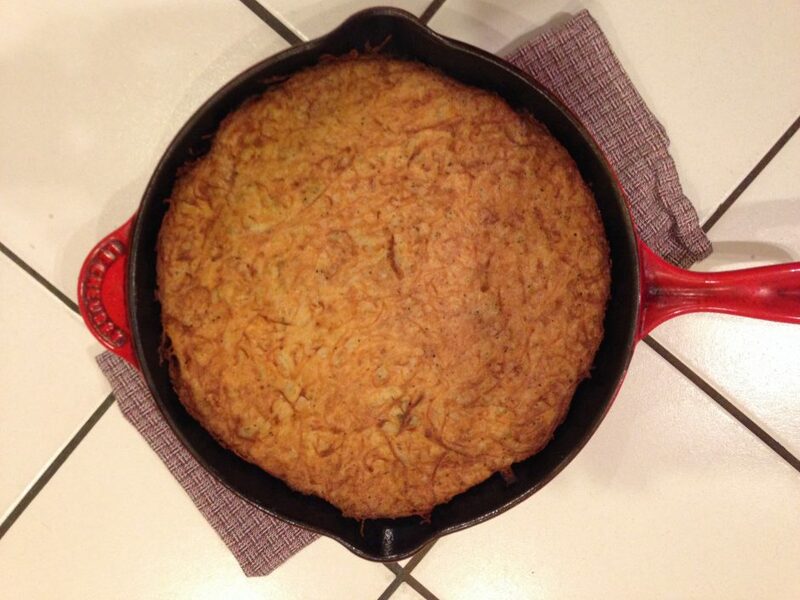 Or at the very least, use a metal baking pan (or a good frying pan) to bake the kugel – not disposable aluminum. (I know this will require dish-washing – but it will conduct heat better and produce a better kugel). Enjoy, and may this year be one of happy cooking, tasty blessings and the peace for which we all pray. Preheat oven to 350 degrees. Put oil in 10-inch frying pan and place pan in oven to heat the oil (the oil should be very hot when added to the potatoes). Meanwhile, grate the potatoes and onions together. Drain off and squeeze out any residual liquid that gathers on the bottom. Remove the pan from the oven and pour the hot oil into the potato mixture. Return the empty pan to the oven and raise the heat to 410 degrees. Stir the mixture to blend and then add the eggs, salt and pepper. Season to taste if any additional salt or pepper is needed (it should taste slightly salty). Carefully remove the pan from the oven and pour the potato mixture into the pan, spreading it evenly. Place the pan back in the oven, and bake for 10 minutes. Lower heat to 350 and continue to bake for 1 hour or until the top is golden brown.